The AS3921 is an advanced Analog Front End with ams' unique boosted NFC technology, ideal for applications that require card functionality, but are environmentally challenged or have limited space for antenna design.Connected through the ACLB or NFC WI interface of a Secure Element or a tag, the AS3921 is ideal for wearable devices and other small footprint devices that requires NFC functionality. Moreover it allows implementing a simpler design than the conventional NFC controller-based architecture, resulting in a more cost-effective solution, occupying a board footprint around one-third smaller, using fewer components and consuming five- to-six times less power in standby.The AS3921 makes the consumer's experience of contactless transactions easy, quick, and completely reliable, whether for payments in shops, ticketing in metro/urban mass transit infrastructure, or access control. In combination with Secure Element to allow payment, ticketing and access control on smart devices. 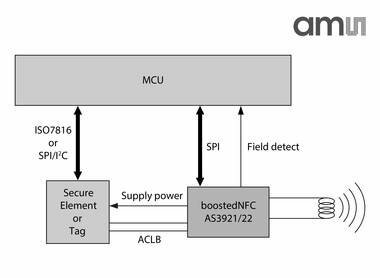 In combination with NFiC™ or some other RFIC tag IC to allow specific features such as Bluetooth/Wi-Fi pairing through NFC, and communication to a microcontroller through an RF interface.